Two Canadian tourists were attacked and robbed in Castries Saturday before noon. David and Carol Goss were on their first ever visit to this country. “Essentially we were on Crick Road looking for the the culture museum and couldn’t find it. Then we saw some people take a small road down towards the water and we followed them,” the husband told St Lucia Times. He said someone attacked his wife from behind. “They grabbed her bag. The strap got broken. She got scratched on the face and the bag was taken from her,” David recalled. He said the assailant ran away. 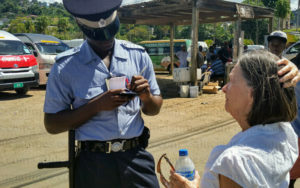 The husband told St Lucia Times that unfortunately, the bag contained his wife’s personal identification, credit cards, debit cards, drivers license, health care and mobile telephone. He said the bag also contained cash. “The cash we can live without, but it is very awkward to lose your personal identification,” David explained. The Canadian tourists, who are in their sixties, have been here for one week. The husband said they were supposed to spend another week here. However his shaken wife said she wants to go home and vowed not to return to this country. The visitors said they have been staying in Soufriere but came up to Castries for the day. 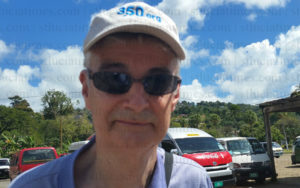 “We have been delighted with the Saint Lucian people who have been so friendly and helpful during the first week of our visit and I guess we had relaxed and let our guard down. It’s unfortunately not a pleasant experience,” the husband told St Lucia Times. An eyewitness who spoke to St Lucia Times on condition of anonymity, said he saw the attacker running with a bag. “I thought it was his bag, but then I heard them shouting and saying that they’ve just been robbed. So I shouted at the guy ‘Yo! Stop! Stop! Stop!’ But he didn’t. He ran towards the Cultural Centre,” the eyewitness disclosed. He described the assailant as being a young man. According to the eyewitness, another incident took place that same morning where a woman’s car was broken into. The car was in the parking lot of the CDC apartment buildings, he said. Well duh, how you expect tourist to come a country and get rob, I live in Trinidad its sickening here! they never black list the country.even if they didn’t ask questions the damn thieves have no right. It’s time for the police to start shooting the damn thieves and answer questions later. St Lucia is getting a terrible reputation and it’s only a matter of time before people start looking at other distinations. IMPACS have the police afraid to do their jobs. It’s time for the government to move forward with the results of impacs and put it to bed. Let the police start doing their jobs. We are suffering as a nation and the criminals know it. Why do you think they are so brazen. The system seems to be failing us. Where is the Cultural Museum???? If this is on a map it needs to be removed cause we sure dont have a Cultural Museum and even the Cultural Center ain’t have anything for a tourist or visitor to go view. It seems that Sans Souci area has become a hot bed for robbing persons, businesses and resiences so maybe the police should be making patrols on foot, bycicles and vehicles and making their presence felt in this area. People have to rob because there are no jobs. Yes i said it… Maybe Fortuna can give the robber a job or maybe the good christian Guy can give the robber a job. No.jobs more crime. Anyone with a tiny brain knows that…..
It’s not much different in other countries. The minimum wage is about that everywhere. There are jobs. People have forgotten about working hard for their money. They start a job and then end up stealing or doing some crap to lose their job. People also forget that with no good grades you can’t expect a great paying job. Some of these no having grades people don’t want to do porter work, construction, garbage collection, etc. they want easy money. There are jobs out there. The lazy bastards just don’t want to work and get easy money by robbing hard working people. By Standers who witness that Crime Should give the police The information as to where that Jackass live .To have him arrested and Charged .This Country is infested with Crime and something Serious have to be done now because it’s almost too late for St.Lucia. My wife booked today for us visit St Lucia in March/ April for some winter sun as a surprise. I showed her the other recent news reports of murders and also this tourist robbery. She thought about it for an hour and we have just cancelled the flight, hotel and car. No penalties as within 24 hours of booking. Sorry St Lucia but we would have worried from now until we got back from the trip. We had hoped to be able to “walk anywhere” on St Lucia rather than be confined to a hotel so it’s best we stay away. Please show this to the tourist authorities if it helps. Too bad. You missed a great vacation. I have been there 30 times and never experienced anything like what happened in this news story. Rethink your vacation based on 2 fools decision to blunder into a bad neighbourhood and get mugged. I am comming to st Lucia in a couple of weeks with my lady and will walk downtown and expect no such treatment .Should it occur i will be prepared though appear as a tourist, with us special forces training and adequately prepared with proper instruments if an assault occurs on us that unassuming tourist will respond with what the assaultant will not anticipate but long remember ! Criminals have no right to create a blacklist for their country. Their disgusting and ignorant behavior will certainly have a big impact on tourism and the islands eCobo my. There are several countries and islands already listed and visitors are being told not to go there. Enough is enough …. St. Lucia is a small island …folk know who the criminals are …apprehend them already; otherwise the island will suffer tremendously. When it rains everyone gets wet.🙏🙏🙏🙏🙏..wake up people. I’m St Lucian and I stay away from Castries as much as possible. The city is a cesspool of drunks, beggars, garbage, prostitutes, and thieves. Worst city in the Caribbean. Every visitor, I tell them stay away from Castries. It’s horrible. A prisoner in your own country. Damn shame. We need to clean up. There’s no city police man on crack road for sure. And just remember you don’t let off your guard anywhere. If was me I’d ask a city policeman the directions and if it’s safe to walk or take a taxi. It’s another unfortunate incident. I think it’s about time the minster of tourism starts educating the tourists that st. Lucia isn’t all that paradise as it isseem, and that we have a real life issue that is plaquing our island, they need to educate the cruise industry to let travelers know that once on island, they need to leave their personal documents on board and walk with very little cash, because this place isn’t all that safe as portraits. These thieves have been getting away with their unlawful activity for much too long. No real progress can be made unless crime is drastically reduced. Banditry has become the order of the day. St. Lucia is vying closely with Jamaica and Trinidad & Tobago as the most crime ridden place in the Caribbean. The place is fast becoming a FAILED STATE. It’s unconscionable for the Minister of National Security to remain comfortably affixed to his present position while criminals are having the feast of their lives. Are we ready to welcome visitors to our shores? Hermin, PM! This is really a sad situation to come on vacation n get robbed period!!! Another red flag not only bcus the individual is a tourist n get robbed it should be highlighted just last week a family fren got robbed at gun point whilst speaking to me on her phone n other items which were stolen n she did report the matter to the police but it’s hush hush bcus she’s not a white woman/person so there n then stigmatization rare it’s ugly head once again. U hve persons who have qualifications n still the salary is ludicrous sad state of affairs for St. Lucia I pray for God’s guidance upon a beautiful n wonderful country I call my 2nd home ..
Crime and other antisocial behavior is inherent in every part of the world , and indeed in St.Lucia. Ironically, social scientists , at least one school of thought among them, are proponents of the “belief” that crime is a common symptom of affluence and prosperity, albeit among myriad other social conditions. This can hardly apply to the social condition of the peoples of our small struggling nation. But consider this. If , as is commonly suggested, crime in St. Lucia is attributable to the malaise of depravity and poverty, then it follows that improvements across-the-board will solve that social problem. By extension the nation’s level of affluence and prosperity will be improved commensurately.That is essentially a “catch-22″… six of one,half a dozen of the other. What aggravates and compounds this untoward situation is the indisputable fact that crime in St.Lucia is characteristically motivated by GREED, not by need; by unmitigated malice and anger, not necessarily by ignorance or even spontaneity. We as a responsible and mature people must stop tacitly condoning the ” sitting on the block , waiting for the silver platter to come ” that preoccupies a large sector of our able bodied youth, and instead mobilize and deploy them in a mandatory national service mode. Pave the way for our people to contribute in wholesome ,constructive ways towards the nation’s acquisition of affluence and prosperity . I would venture to suggest that people, at both the personal and community level, who have been engaged in the acquisition of national prosperity, would be keen on doing whatever they think it would take to promote ,preserve and protect the Nation’s Wealth and by extension, their personal lots in life. That would give new meaning to the typical ” this is my country” chant. That would be true patriotism. That certainly is not above and beyond the collective reach of our people. These tourist are not rich people. They work hard and save money all their lives to enjoy their retirement and travel. This is what they get for vacationing in St. Lucia. Justin Trudeau and the Canadian government together with the Canadian travel agencies, travel websites and travel writers should discourage Canadians from visiting such countries as they are dangerous places to visit. These poor seniors could have been killed. Not good. It appears that the St Lucia government is not doing enough to protect visitors and their main source of their economy. Much as I feel bad for the couple, no, the country is not a dangerous place. Even by their own admission, they felt, right up till this point, that Saint Lucia was very welcoming and enjoyable and when you consider that over 1 Million visitors come to Saint Lucia each year, we are relatively a safe place. Just like any other country – Canada included – we have areas where you are more likely to be a victim of this kind of crime. It is always advisable to take precautions with your valuables when in an unfamiliar place – use a separate pouch under your clothing, to secure passport, any extra cash and cards: this is what any government and travel site should advise travellers in general, wherever they travel. I’m sorry if they let this incident stop them from enjoying Saint Lucia for the rest of their stay and perhaps again in the future…I hope they are treated well for the rest of their stay. I will not visit St. Lucia again either. Not because of the one kid robbing and old couple but because the comments on the news show a tendency to victim blame instead of dealing with the problems in the country.